Composure Mini Bite Sized Chews provide a calming formula to support balanced behavior for dogs and cats. Composure Mini is ideal for situations when your pet is exposed to increased environmental stressors, including: changes to the environment, company or parties, veterinary or grooming visits, boarding or holidays, boredom or separation anxiety, moving or traveling, fireworks and thunderstorms. 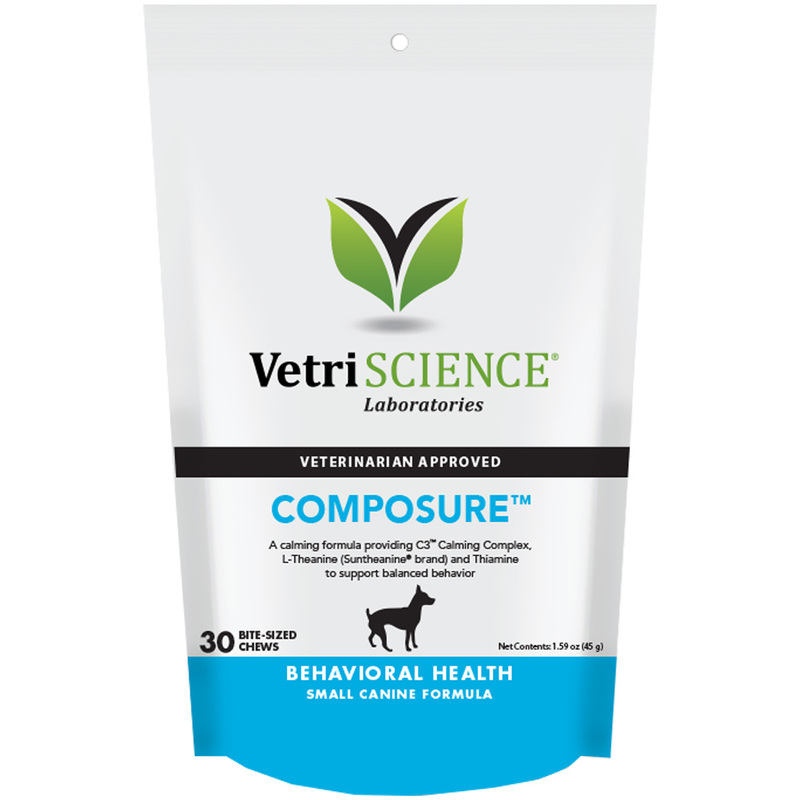 Composure Mini will help stop stress related behavior while keeping your pet's personality and energy level. It is safe to use daily, and does not cause addiction, drowsiness or impaired motor skills. C3 (Colostrum Calming Complex) is isolated from colostrums proteins, which have been found to support cognitive functioning and support stress reduction. C3 works synergistically with L-Theanine, which is also in this formula, to promote relaxation and cognition in pets. L-Theanine supports calming and relaxation, reduces irritability and low mood states. This natural occurring amino acid is found in green tea, and is a derivative of glutamic acid, a neurotransmitter in the brain. It can help the body produce Dopamine, GABA and Tryptophan, other calming amino acids, and helps bring certain neurotransmitters into better balance. Thiamine (Vitamin B1) helps manage stress and reduces irritability. Thiamine has been shown to calm and soothe anxious animals by affecting the central nervous system. Without Thiamine, pets exhibit mental confusion, muscular weakness, muscle spasms, nervousness, as well as weight and appetite loss during times of stress. This product can be used as needed for immediate support or on a daily basis for on-going support.